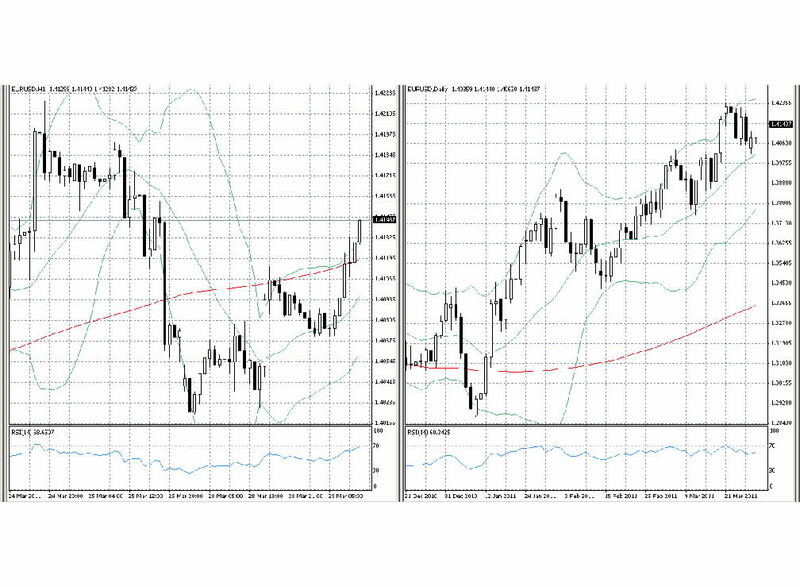 An overview of Thursday’s realtime forex price action for EURUSD shows that the rate resumed its upward trend, although GBPUSD fell slightly and USDJPY extended its range to the upside. This indicated an extension to the notable rally in the EURGBP cross rate, although the EURCHF cross declined on the day. A technical EURUSD analysis shows that the rate continued its downside corrective activity on Monday to a new recent low point of 1.4020, before then reversing to end higher on the day at 1.4086. This reversal lends support to the view that the overall rally in EURUSD should continue medium term, and a reasonable Euro forecast still targets the key 1.4281 reversal level of November 4th once resistance at 1.4247 is overcome. Beyond that major resistance point, resistance then appears at the 1.4579 level for EURUSD. Initial support for the rate shows up in the 1.4020/53 region, but a break below key support indicated in the 1.3752/1.3861 region would tend to neutralize the currently bullish technical picture. In addition, the rate’s key 200-day Moving Average is now at 1.3356 and rising. This also indicates a bullish medium term outlook for the rate and its level should effectively limit downside price action until a significant trend reversal takes place in EURUSD. Furthermore, EURUSD’s 14-day RSI has begun rising again after it had normalized in the wake of achieving almost overbought levels during last week’s dramatic rise. The indicator is now reading in the upper part of neutral territory at 60 that could still impede upside price action in the near term. 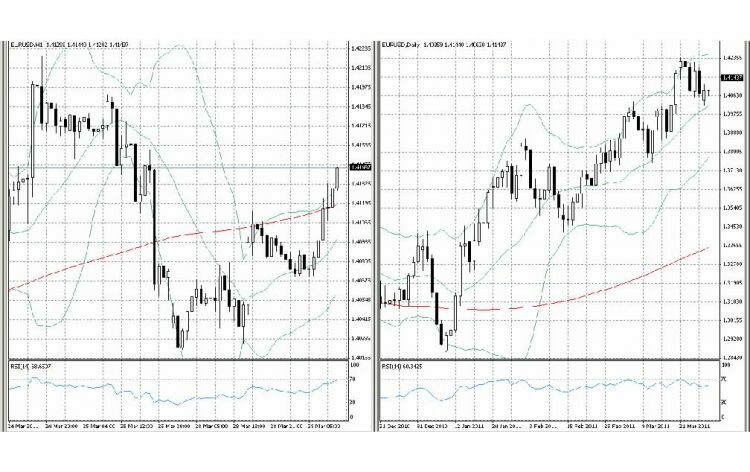 Chart 1: Side by side Hourly (left) and Daily (right) candlestick charts of EURUSD showing Bollinger Bands in pale green, its 200-period MA in red, trend lines in purple, and the 14-period RSI in pale blue in the indicator box below the charts. Cable broke key psychological support at 1.6000 to reach a new recent low at 1.5935 on Monday, but then made back most of its losses to close just slightly lower on the day at 1.5991. This additional strong downside activity in GBPUSD came after the rate had made an equally impressive rally last week, and it also threatens the medium term rally that commenced at the important 1.5343 reversal point of December 28th, 2010. Furthermore, the latest drop penetrated below key support at 1.5976 that would tend to accelerate the downside in the near term toward 1.5750, if sustained. To the upside, the resistance level to best in GBPUSD remains 1.6399, and then above that the rate should meet resistance at 1.6456. USDJPY rose initially to 81.83 on Monday, but then spent the rest of the day’s session trading in a tight range between 81.53 and 81.80. The rate now needs to overcome resistance at 81.98 to push significantly higher. Beyond that, resistance is seen at 83.29. In addition, the chart for USDJPY remains dominated by the rate having made a fresh post-war low at 76.41 last week, with subsequent consolidation taking on the look of a possible flag formation that could now be resolving into another sharp rally of a similar magnitude to that seen from 76.41 to 81.98 with the gains seen last Friday and Monday. The 76.41 level now remains key support to break in order to see further downside for USDJPY, but until that level gives way, additional upside corrective activity should prevail. EURCHF has recently been correcting higher off of its latest medium term low at 1.2406 seen on March 17th within its overall medium term downward trend. Nevertheless, while Monday’s price action again pushed higher to peak at 1.2981, the rate ended lower on the day at 1.2912. Further corrective upside price action remains possible for EURCHF, although any short term corrective rally in the cross should meet initial resistance in the 1.3039/67 region and then above that at 1.3203. On the other hand, initial support appears at 1.2705, but look for the downtrend to reassert itself if and then key support at 1.2400/06 gives way.